Late last year I began working in the Students' Unions at both the University of the Arts London and London School of Economics and Political Science. 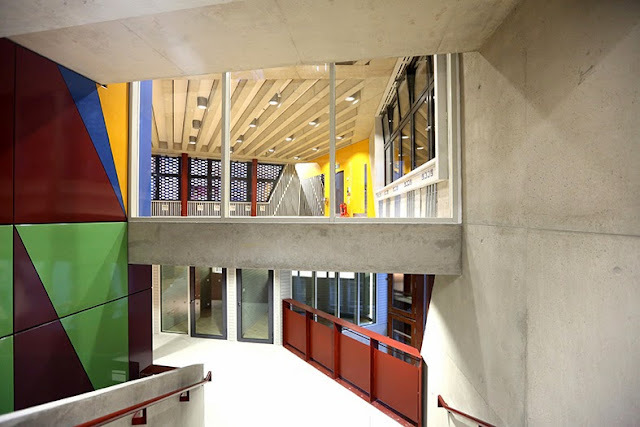 While the former might seem like a more obvious choice of employment for a design nerd like me, you're about to find out why working at LSESU is just as attractive: at the beginning of this term we moved into a brand spanking new Irish-designed architectural icon! 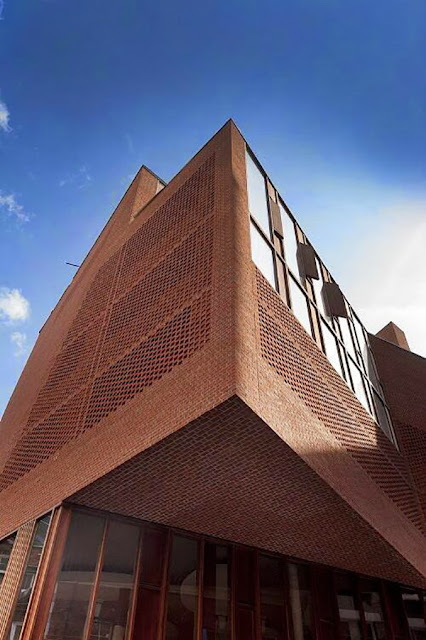 The Saw Swee Hock Student Centre (or simply the Students' Union building, as my colleagues and I would much rather call it) is the latest red brick behemoth to come from O'Donnell + Tuomey Architects. 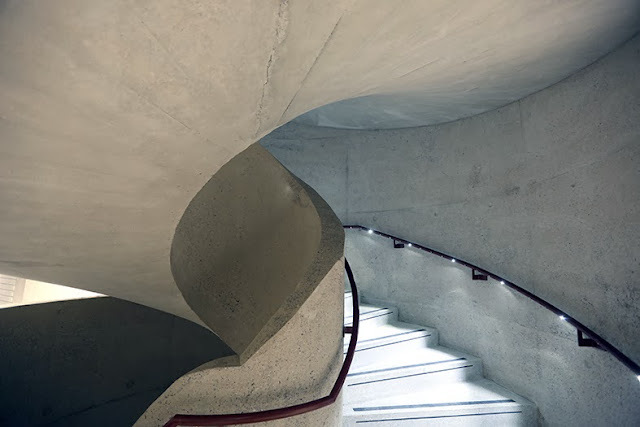 It's their second building in the city (The Photographers' Gallery is their first) and houses activity spaces, a bar and cafes, a fully kitted-out gym, various student services and a massive basement venue, all for the students of LSE. LSE's city-centre campus in Aldwych is small and tightly packed (but with this new building and the New Academic Building it's gradually spreading towards Lincoln's Inn Fields). 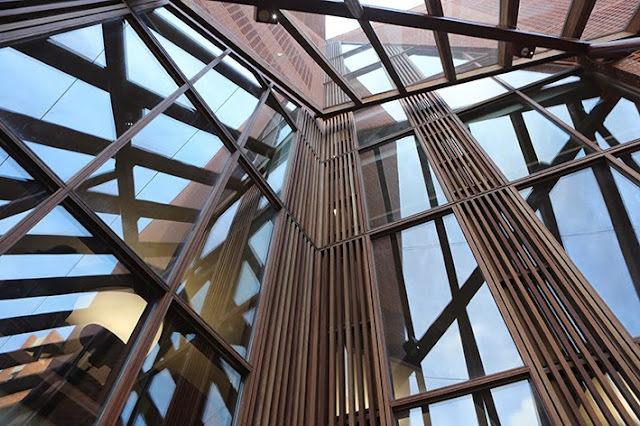 It's a permeable campus: you can wander through its streets without passing through gates or being walled in, and the Saw Swee Hock Student Centre sits at the meeting point of a number of the campus' streets. An inspiration for the architects was the extent of activity within LSE that takes place on these campus streets: Houghton Street in particular is full of student and society activity seemingly every hour of every day and is lined with noticeboards full of posters and flyers. Seeing this street activity, O'Donnell + Tuomey created a design which would bring the streets of the campus into the new Students' Union building: you can see this in the building's airy spaces, the way in which you find yourself wandering from floor to floor and the materials you're surrounded by: concrete, wood and above all brick. The material use also makes for a wonderfully tactile building, mixing a variety of surfaces, textures and colours to great effect. 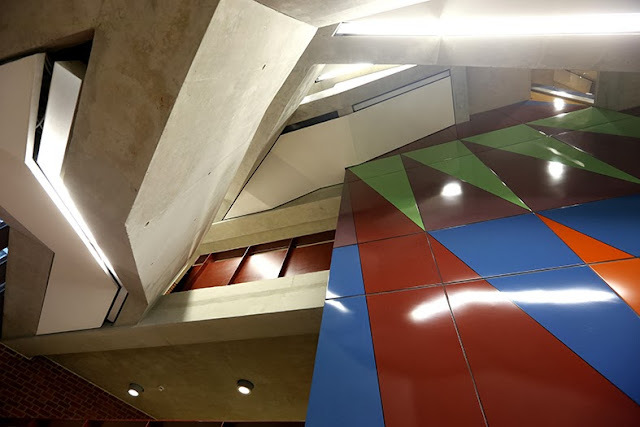 Another key feature of the building is the service core, cased in brightly coloured metal and dubbed a 'totem pole'. 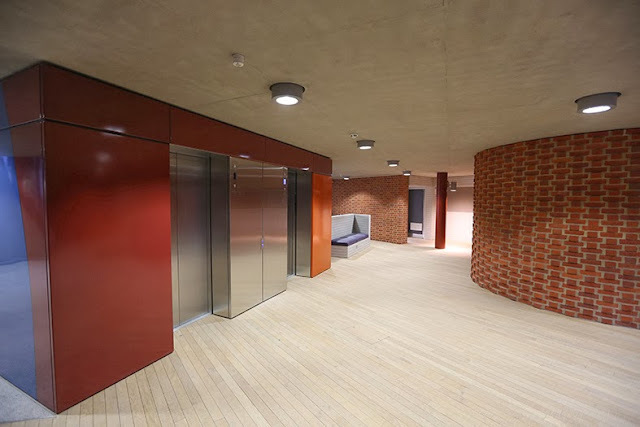 The colour palette used here and extended into some other parts of the building (such as the bright yellow toilet areas) isn't as typical of the architects as the cast concrete, use of brick and regular splashes of iron oxide are. I'm not sure I particularly like this spine of brightly-coloured panels but that's probably not that important: the totem pole is the main area for postering in the building, so is likely to be covered in invites to join societies, prompts to vote in LSESU elections and posters for events before too long, bringing in that idea of postering that the architects saw on Houghton Street. One of the most striking features of the building - particularly from the outside - is the brickwork, done at certain points of the building in such a way as to look perforated (pictured at the top). This has prompted some LSE students to nickname the building the Cheesegrater (they don't seem to know that the moniker is already taken by Richard Rogers' 122 Leadenhall Street), but nonetheless creates the effect that the exterior walls begin to open up and allow the interiors to peek through. It's particularly useful for spaces that could do with light but shouldn't be completely on show, such as the gym and the multi-faith space but features in other spaces too, including my new office. The perforated effect doesn't seem to rob spaces of light, and I'm curious to see if in the summertime it keeps interior spaces that little bit cooler. This is a building with a massive budget (£21.5 million, last I heard), and you can really see it: from impeccable finishing to Olympic-standard gym equipment no expense has been spared. 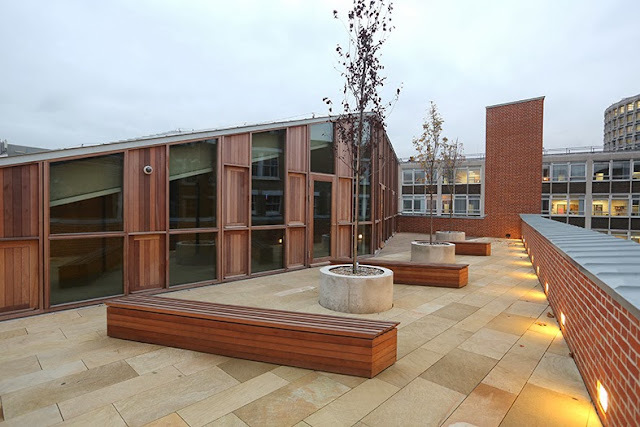 It's also got impressive eco credentials: BREEAM has deemed it Outstanding. I'm looking forward to being in close contact with this place over the coming months and seeing how it stands up over time and use: it's a beautiful space and all looks great on paper, hopefully remains as thoroughly enjoyable to use as it is to look at.